Images from Cassini seem to indicate deltas and river channels. Could electricity have formed these features on Titan? Recent data from the Cassini-Solstice mission is said to reveal oceans of liquid ethane, in one case occupying an area as large as 26,000 square kilometers, in Titan’s north polar region. Cassini-Solstice has been analyzing information about Saturn and its family of moons for more then 10 years, with Titan, the largest moon in the Solar System and the only one with an atmosphere, as its primary target. Several previous Pictures of the Day discussTitan and its bizarre topography, as well as the electrical connection that it shares with its giant parent’s plasmasphere. Radar images centered at 70 degrees north latitude reveal a “…coastline and numerous island groups of a portion of a large sea.” A comparison of surface features between 2005 and 2007, scientists found that several of them have moved from their previous positions by as much as 30 kilometers. 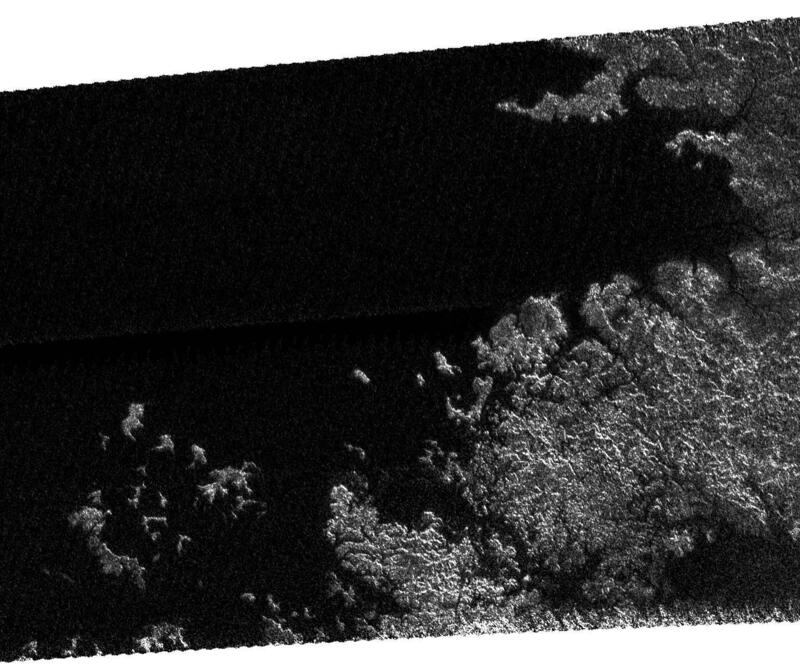 Since Cassini’s radar is able to penetrate the cloud cover obscuring Titan from optical instruments, landmarks can be mapped and then compared to earlier scans of the surface. The unexpected movement is thought to be from “disconnection”, when Titan’s crust separates from its core, allowing the 50 different grid markers to “slide” around more easily than if they were connected by solid buttresses. The grid-plotted formations included “river valleys”, mountains, canyons and other terrain that would normally be slow to change in just two years of observation. In a previously mentioned Picture of the Day, it was noted that flowing methane (or ethane) has never been found on Titan. The so-called “river valleys” on Titan do not look like they were carved-out by flowing liquids. Wal Thornhill predicted that a close examination of the images would demonstrate that the channels go uphill and downhill – not like the action of a moving stream that would always be downhill. In reality what we see on Titan are examples of “sinuous rilles” and are the result of electric discharges. Another recent anomaly discovered on Titan is the rotating vortex of clouds at its south pole. The most striking aspect to Titan’s south polar vortex is that it is reminiscent of a similar formation on Venus. It has been argued in the past that Venus and Titan might be new members of the Solar System whose dense atmospheres have not yet been dissipated by this high radiative environment. They appear to share many characteristics because of that atmospheric density. One of the principle tenets of Electric Universe theory is that the Solar System has been the scene of catastrophic encounters between charged planetary bodies at sometime in the recent past. Electric fields interacting with gigantic clouds of plasma caused major disruptions both in orbital arrangements and geological stability among the planets and moons. Indeed, many new objects may have been added to the mix in the form of cometary bodies scaling down in size from something as big as Venus to particles small enough to make up Saturn’s rings. If it can be suggested, based on the presupposition that Electric Universe proposals are correct, that Venus is a new member of the Solar System, then why not apply the same theory to Titan? If Titan is a relatively new addition to Saturn’s system of some 60 moons, then the fact of its methane atmosphere does not indicate replenishment, but youth. There simply hasn’t been enough time for Titan to lose its atmosphere—its atmosphere has only recently been created. If, like Venus, Titan is not an ancient member of an even more ancient system of planets, but is a new member of an entirely remodeled system that has come about recently, then new ways of describing its structure and behavior must be considered. Titan is an electrically charged body that is constantly bombarded by an intense ionic storm from Saturn. It shares many characteristics with its cousin moons, Io and Europa, that orbit the planet Jupiter: a particle fountain from its poles, a toroid of charged particles in a sheath and exchanges of massive electric charge.